Can this be Winnie the Pooh himself? For sale at the Broc Troc in Menton last weekend. 'I know,' said Pooh humbly. Est-ce Winnie l'Ourson lui-même ? Il était en vente au Broc-Troc à Menton le week-end dernier. 'Je sais,' a répondu l'ourson humblement. I don't think so Jilly, I have him here sitting on my chair in my bedroom haha! This bear however is absolutely wonderful, I wonder how many children have treasured him..
sure seems an old hand at being cuddled! What a wise old bear s/he looks Jilly! 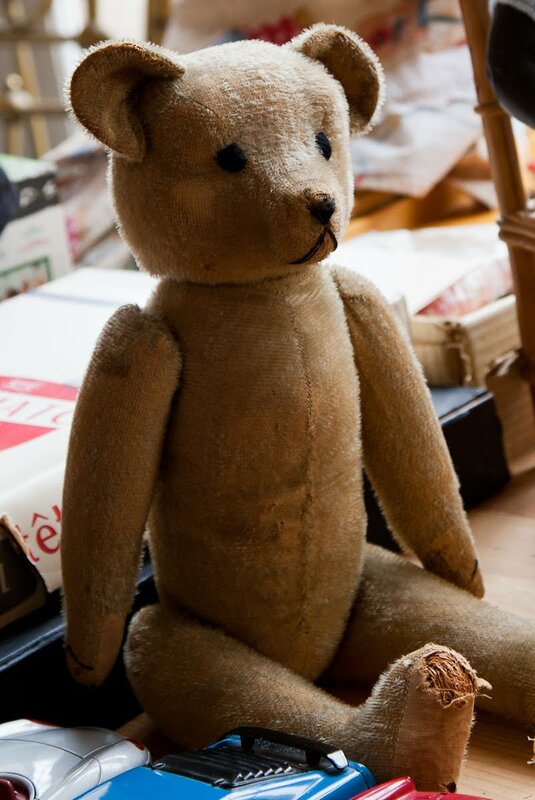 I have an old bear almost like this, a button-in-the-ear Steiff one, just like the one on this site, but without the sailor blouse and although Steiff toys are pricey, I am sure my parents didn't pay that much! a very old and much beloved fellow. A favorite of many children. My kids, grandkids, and even my dogs who claim Pooh for themselves have loved him over the years...only ours is a mellow, honey yellow. Oh, poor Pooh, he has a bit of a sore foot! Wonderful. I'll bet many of your readers still have their childhood bears. Looks like a very old bear. This is the sweetest shot today! Oh what love this bear has probably known. Love the Milne quote . . . tiddely pom. The animal of the most huggable kind. So original. A second-hand teddy - charming! If you are interested in seeing the original stuffed toys that belonged to Christopher Robin Milne, they are on display in the Central Children's Room at the New York City Library at 42nd Street and 5th Avenue. They were taken to the U.S. as part of a promotion tour for the books, and never made it back to England. I have an old Steiff one, too, who I knitted a red pullover ages ago. Hello, cute bear with worn toe. . . how loved you have been.